What does Washington have to do with audiovisual preservation? Washington was the host of this year’s IASA conference. Washington is also the home of the world’s largest audiovisual preservation program. I had the privilege to attend and present at this year’s International Association of Sound and Audiovisual Archives (IASA) conference held at the Library of Congress in Washington DC. The title of this year’s conference was ‘A World of Opportunity: Audiovisual Archives and the Digital Landscape’. The IASA conference brings together many professionals from various sectors of the audiovisual heritage community – 250 delegates attended, representing over 30 countries. To give you an idea of the diversity of interests represented at IASA – IASA held committee and section meetings for the Europeana Task Force, Organising Knowledge Committee, Broadcast Archives Section, National Archives Section, Research Archives Section, Discography Committee, Training and Education Committee and Technical Committee. And this was before the official opening! I was involved in the technical committee meeting. For the past several months, I have been writing material for the upcoming IASA TC06 Guidelines in the Production and Preservation of Digital Video Objects. It was a fantastic opportunity to sit down face-to-face with my fellow contributors and get an update from the project team on how we are progressing with the project. I’m also pleased to report that I’m now a full-fledged member of the IASA Technical committee, which means that I will assist members as a technical specialist and contribute to the field in ways such as the development of the TC06. Oliver Morgan on the work the Library of Congress and the Federal Agencies Digitisation Guidelines Initiative (FADGI) on MXF AS-07 testing and standardisation. Mike Casey from Indiana University on managing efficient media digitisation. Interesting to get a university perspective on preservation while maintaining efficient and productive outcomes. Dave Rice on the upcoming IETF standardisation of Matroska, FFV1 and FLAC. The panel ‘Seeing Voices: Experience with Imaging Methods for Recorded Sound Preservation’ was very interesting and discussed 2D and 3D imaging methods of extracting audio optically. To reflect this year’s positive and proactive theme, my presentation concentrated on three case studies relating to recent projects DAMsmart has completed. My paper was titled ‘Archives Enabled: Case Studies on the Digitisation and Subsequent Usage of Audiovisual Collections‘ Not necessarily focusing on just digitisation, I wanted to demonstrate some of the innovative and efficient access opportunities that are available through the digitisation process. RICH END-USER EXPERIENCE – Metadata to enable deep search of an oral history archive using the Australians at War case study. CUSTOMER EFFICIENCY – Delivering a transmission ready broadcast archive using the Radio Television Hong Kong case study. CONSERVATION = RECOVERY The importance of media preparation in the digitisation process using the National Archives for Fiji case study. Washington DC made a great host city for the conference, and I think it goes without saying, but I will say it anyway: The Library of Congress was an exceptional venue for the conference. I attended the professional visit to the National Audio-Visual Conservation Center, 2 hours out of DC in Culpeper, Virginia. The purpose-built facility is located inside Mount Pony, which originally served as a nuclear money bunker. 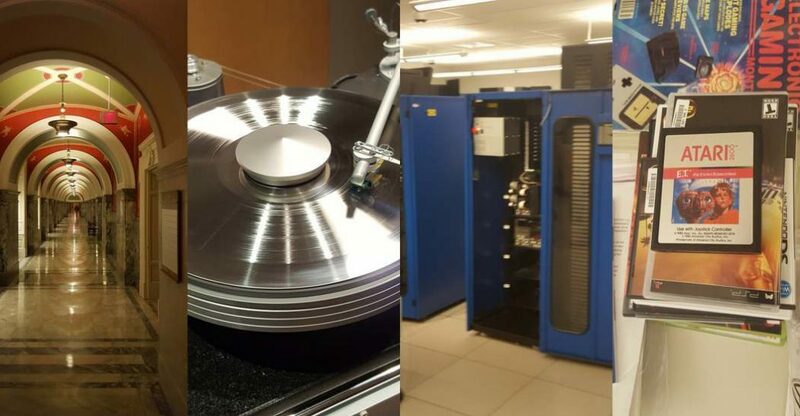 The facility has very impressive preservation and reformatting facilities, including the familiar SAMMA video digitisation product line, class audio suites demonstrating digitisation of cylinders and metal mothers. Items on display were fascinating and diverse. We were able to view the only known copy of 1910’s Edison’s ‘Frankenstein’ film, through to sitting on an accessioning table was a copy of the now infamous Atari’s ET video game. The organising committee did an excellent job to organise a very successful conference and program and I am already looking forward to the 2017 conference.